AUTO (VC) 1/Turn GB1: [Counter Blast 1] When yor Rearguard is placed in the Soul, you can pay the cost. If you pay it, choose 1 Grade 3 card in your Soul that has the Magia ability, and add it to your hand. AUTO: When this Unit is placed on (VC), look at the top 2 cards of your Deck, place 1 into your Soul, then place the other on the bottom of your Deck. 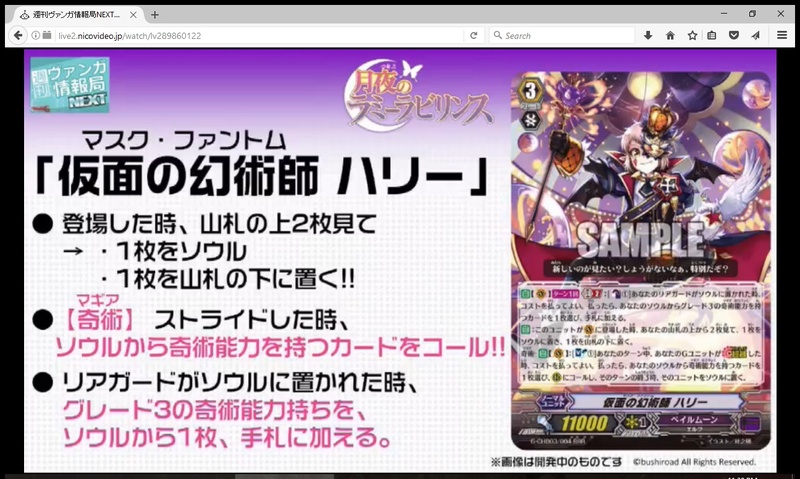 Magia – AUTO (VC): [Soul Blast 1] During your turn, when your G Unit [Stride]s, you can pay the cost. If you pay it, choose 1 of your cards with the Magia ability from your Soul, Call it to (RC), and when that turn ends, that Unit is placed into the Soul.